Attunity Replicate for SAP is a high-performance, automated and easy to use data replication solution that is optimized to deliver SAP application data in real-time for Big Data analytics. Many of the world’s largest enterprises run their business on SAP applications. They need to make live production SAP data seamlessly available across diverse platforms and hybrid environments. But achieving this can be cumbersome, time-consuming and costly due to the inherent complexity of SAP data structures. Many of the world’s largest enterprises run their critical business operations on SAP applications. Using one or more SAP applications such as ECC, HR and CRM, these organizations capture critical objects within SAP systems. Making this data available for business intelligence and analytics is a common need in order to support decisions and analytic processes that improve operations, optimize customer service and enable the company to compete more effectively. To do so, companies often look for ways to bring live SAP data into their analytics platform of choice, where they can merge the SAP data with other business information and serve a growing number of users. However, delivering this SAP data can be challenging due to the underlying data model and complex data structures. The process can be complex, manual and prone to delays. Attunity Replicate for SAP moves the right SAP application data easily, securely and at scale to any major database, data warehouse or Hadoop, on premises or in the cloud. This solution builds on decades of leadership in enterprise data replication and SAP integration and is unique in that its innovative technology converts the complex data structure into an easily accessible data model using an SAP certified agent. The solution provides a unified means for replicating SAP documents, transactions and business data to a diverse ecosystem of analytics environments. By analyzing this data, enterprises can improve operations, capitalize on customer opportunities and compete more effectively. Turn a typical complex data model of thousands of tables into a data replication task at the business or transaction level, quickly and easily. Attunity Replicate for SAP automatically incorporates SAP text and descriptions into the target table and column names, simplifying user comprehension of target objects. It copies documents, transactions or business data, from any standard SAP ERP module, including CRM, HR, SRM, or any industry specific module. Complex SAP structures such as pool and cluster tables are supported, as well as custom tables. 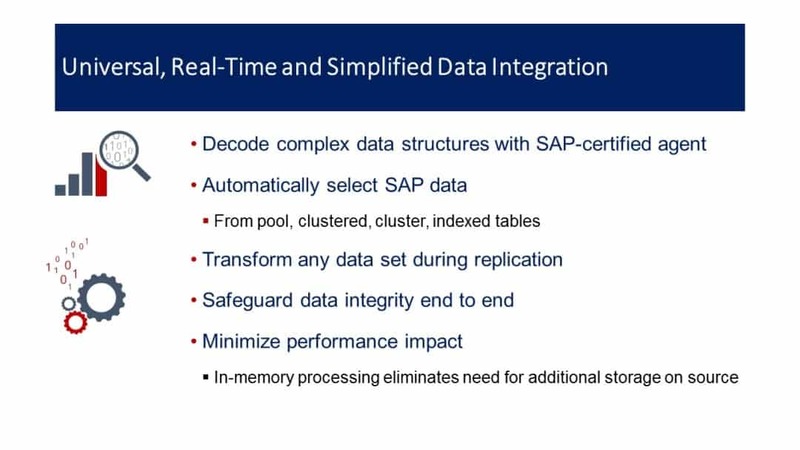 Attunity Replicate for SAP also replicates external data to SAP’s HANA inmemory computing platform, creating additional analytics opportunities. 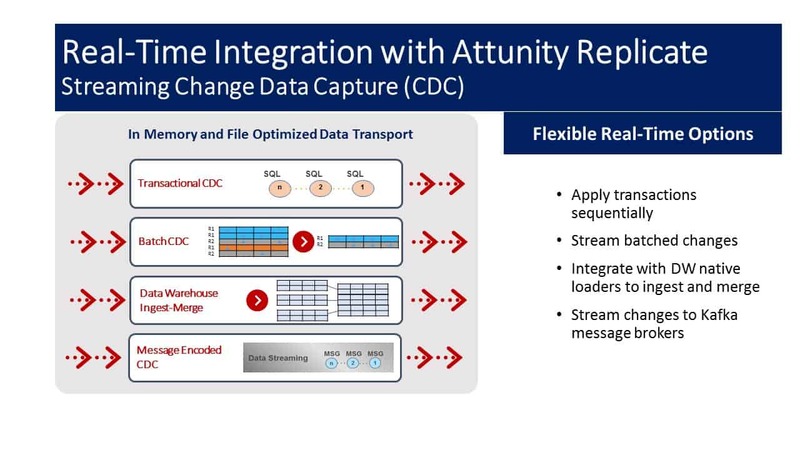 Attunity Replicate for SAP change data capture (CDC) technology continuously updates targets to enable real-time insights. Data transfers are intentionally designed to maximize throughput and minimize latency. Attunity Replicate for SAP can apply transactions or changes in order and in real time. It compresses, encrypts and transfers data in parallel streams into, across and out of cloud architectures, including Amazon Web Services, Microsoft Azure and Google Cloud. Replicate data from SAP production with zero downtime, with no additional hardware required on the SAP source. In addition, by identifying changes within source logs, Attunity Replicate CDC protects the performance and integrity of production transactions.